It is not simple to judge an innovation, to evaluate its relevance in a given industry or sector. It is also surprisingly hard to figure out whether a solution or product is really new. We are flooded each day by dozen upon dozens of pitches from companies touting their products (it’s revolutionary! ), their thought leadership (meet our CEO!) or their next event. Sorting through them to discover what might be of genuine interest to our readers presents a daily dilemma. All the pitches claims adjectives like “most innovative,” “groundbreaking,” “best,” and “first.” Every company, it seems, regardless of size, is “the best of the best” in blockchain, in trade finance, in whatever. Many of these companies operate in similar areas and offer solutions that look remarkably similar. Sometimes, just a little bit of probing reveals the hollowness of the claim. “First” becomes “first for a company of our size in our market” or “first if you ignore everything that came before.” Sometimes there isn’t enough information available on what they really do. What guides our selection of innovators is the same thing that guides our selection of stories: Our readers. 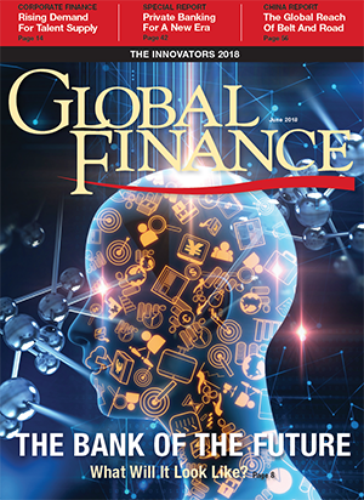 We choose our story topics with our audience of financial professionals firmly top of mind, seeking to deliver what’s most interesting for our readers—and they are very interested in where innovation is taking the industry. Thus, in this issue, we try to answer such questions, with a cover story exploring The Bank Of The Future and our annual Innovator honors. The cover story points to a vision for the future, and shows how finance innovations are tied to regional needs. This year’s Innovation Issue also reflects a change in our approach. For one thing, we now debate innovation on a regional basis. Also, while we still celebrate innovations of financial institutions, we are also recognizing innovative companies and individuals. The results—at times surprising—will help our readers think about innovation in a new way.